After my curiosity was awakened by Bill´s comment about Offlow, I decided to embark on this post about Offlow, although it´s a little further out than the remit of this blog. The rule of thumb is basically if you can hike there and back from Tamworth, or more specifically Leyfields within a day then it’s included. Abe and Ernst had this in their contract and refused to go any further. Like some rumbling herbivore though, the blog plods through the landscape with its head down and stops at any choice juicy sites, munches through and stumbles aimlessly on. In the search for juicy sites though I´ve been caught far out on the outskirts of Tamworth Timehikes. It’s a sort of slow travel , but even with slow travel you could cross the globe with enough time so have to agree with Abe and Ernst and pull back across the borders after this one. Anyway now were here might as well enjoy it. It´s located immediately north of the A5, (watling street) near Weeford, and just west of Swinfen, a public path goes right past it. Lichfield may also have been a good base for missionary work. 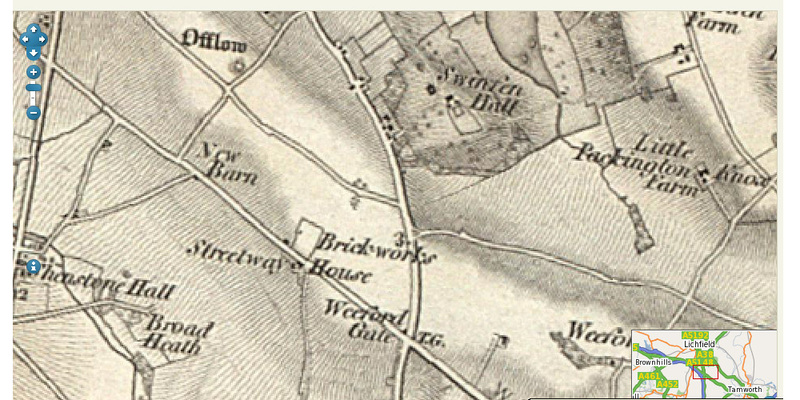 Woden worship in the area is attested by the place names Wednesbury and Wednesfield, while Weeford, the name of a parish south-east of Lichfield, indicates the existence there of a pagan shrine. 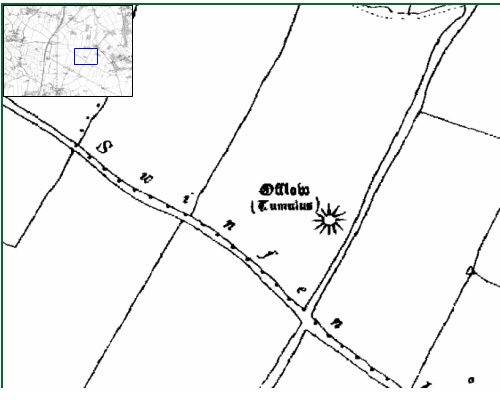 The shrine could have been associated with the tumulus called Offlow, which lay in Weeford parish to the north of Watling Street. It may have been the burial mound of the Mercian royal family when it was still pagan and thus the focus of pagan feeling to be counterbalanced by Lichfield. (fn. 20) The tumulus was important enough to give its name to the hundred of Offlow. 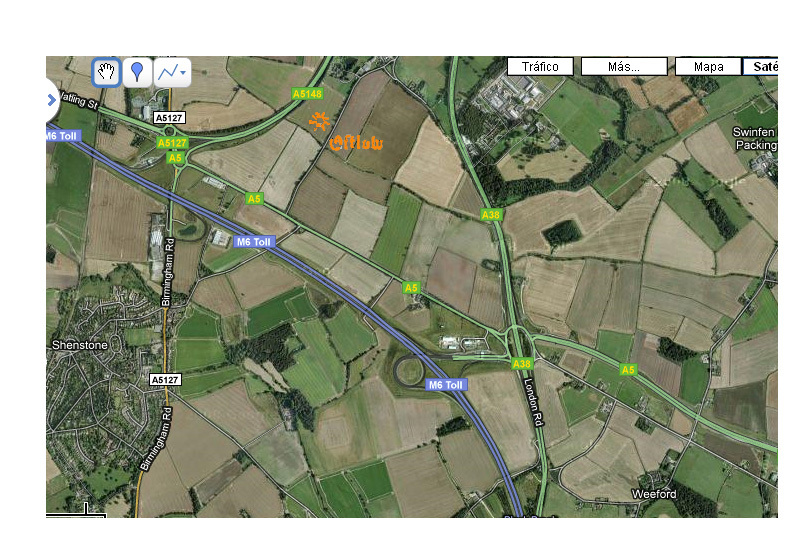 Lowe itself means barrow, a burial mound, if that’s what it is, is an open question if indeed it still exists. A number of encyclopedia like volumes written in the early 19th century mention it. Their thorough recompilations of the landscapes never seem to have been repeated or at least there online! Anyway here´s the extract on Offlow. 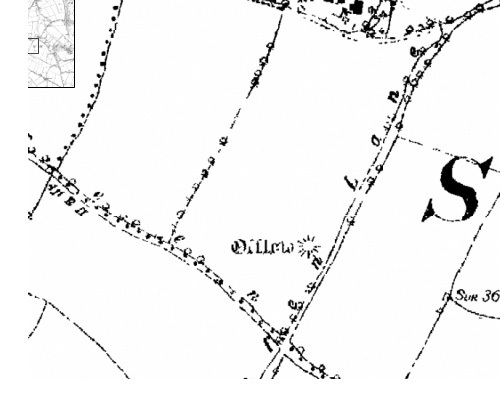 The city is built in a pleasant and fertile vale, within two miles of the Roman station Etocetum, and about the same distance from Offlow Mount, another station at Swinfen. 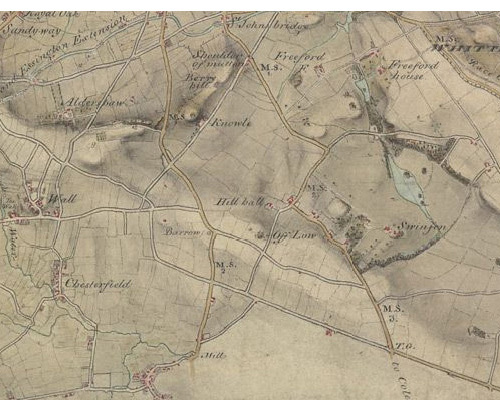 The description above gives it some geographical context and hints at some sort of connection, by mentioning its location at an intersection of Watling Street and Borrow cap Hill, another site, talked of as a Saxon site. He goes on to conclude that it’s the monument of some eminent person, although not Offa, military in origin and Saxon. The above extract is the only mention of something physical, an exploratory mount, some forty feet in diameter. As I haven´t visited the site, have no photos, whats there? At least those exact measurements demonstrate that someone must have measured something even if it was 200 years ago. So were getting something. There was something tangible called Offlow. Over 150 years passes before I can find anything else written on it. Was it worth the wait, well decide for yourselves. Bronze age round barrow, known as site Offlow Tumulus. So possibly giving its name to a hundred, rumours of burial places of kings and its reduced to this, what happened? Maybe there is no physical remains and pastscape simply entered in the info because of previous representations on maps and previous textual evidence, I really don´t know. I´m in no position to offer any insights into its origins, use and even it still exists, could have been bronze age, could have been saxon, could have been royal(they did build them for burial purposes,especially in pre-Christian times,) could have other origins,could have been a saxon renaming and appropriation of older site, so many possibilities…. Its location though next to Watling street, Roman Wall, Lichfield and other earth works is intriguing though and is more than worth investigating(mentioning the Staffordshire hoards findspot being in the vicinity could open a can of worms, take a look at an interesting post about this phenemenon on Brownhillsbob´s blog ). 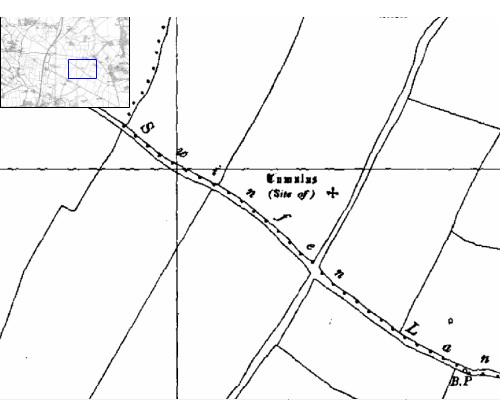 The first ordnance map from 1815 tells us more about its location and intriguing possibilities below. The 1837 First series ordnance map again with Offlow prominently depicted above . This period seems to be the high point for interest in the site, it was a time of antiquarian inquisitiveness so it’s not surprising. Above I´ve squeezed together 4 maps, from left to right respectively, 1887,1899,1923, 1948, click on each one for larger view. 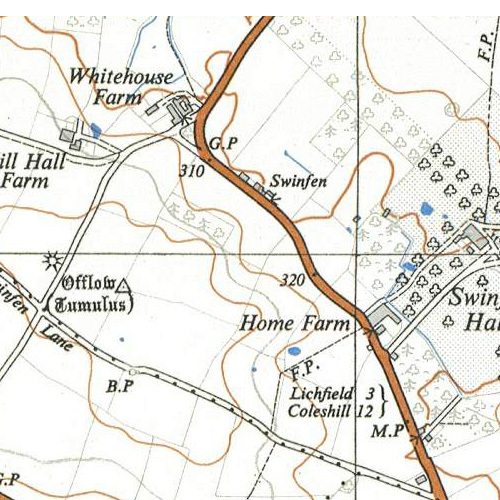 The above clipping is of the 1955 ordnance map. It´s the last siting I have of Offlow. It´s pointed out as site of as oppose to the usual Tumulus. Had something happened to the place? 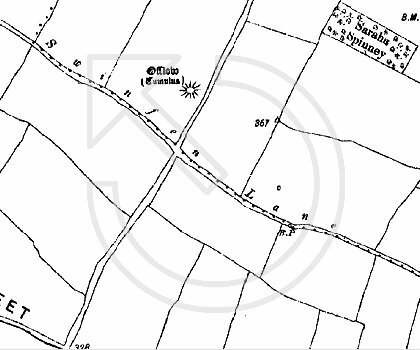 Anyway to this day it´s not depicted in any ordnance maps. Did map makers lose interest, were the russians behind it or did it get ploughed under? 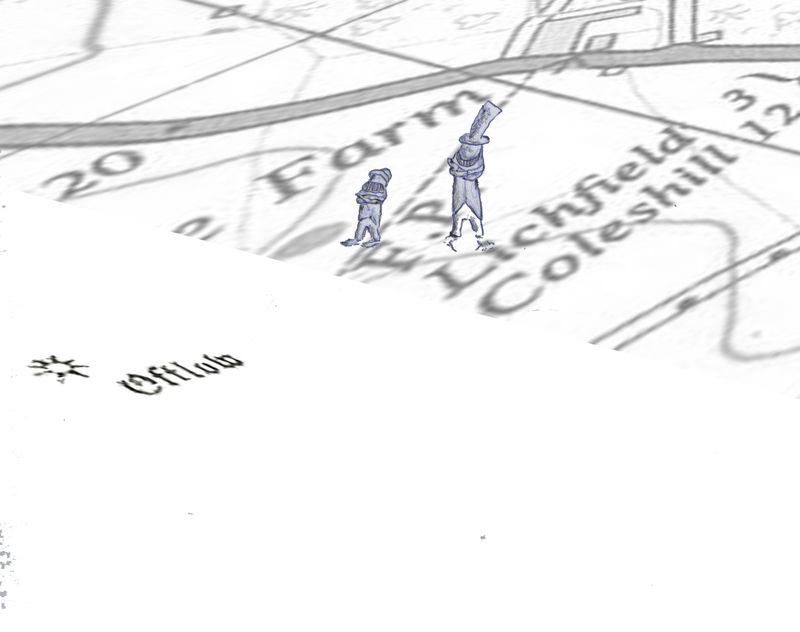 My desperation led me to have a look through streetmaps, no luck hedge blocking the view, if anyones got photo of, knowledge of the fate of Offlow appreciated. Bill mentioned in his comment a mobile mast ! Above,X marks the spot. depictions of Offlow through time. Starts with an embryonic form, ends with tombstone like symbol. This whole post about a site possibly dating back thousands of years made me think about comparing other exploring much more recent sites. I don’t remember where I read it but someone said that recent history, within living memory was easier to investigate. I suppose recent history could be seen or perceived as more the realm of the amateur. It´s perceived that anyone can look at old photos, maps talk to witnesses and piece together stories. Older prehistoric landscapes though on the other hand are more inaccessible, they are the realm of the ´archaeologist´ They are percieved as having the know how and skills to decipher the mysteries. The inaccessibility makes it more select, prestigious from the outside. Thats not to say there not many professionals studying recent pasts, but there traditionally has been leaning to these prehistoric inaccessible past sites. It’s as if the archaeologists are living in other far off uncontested worlds.